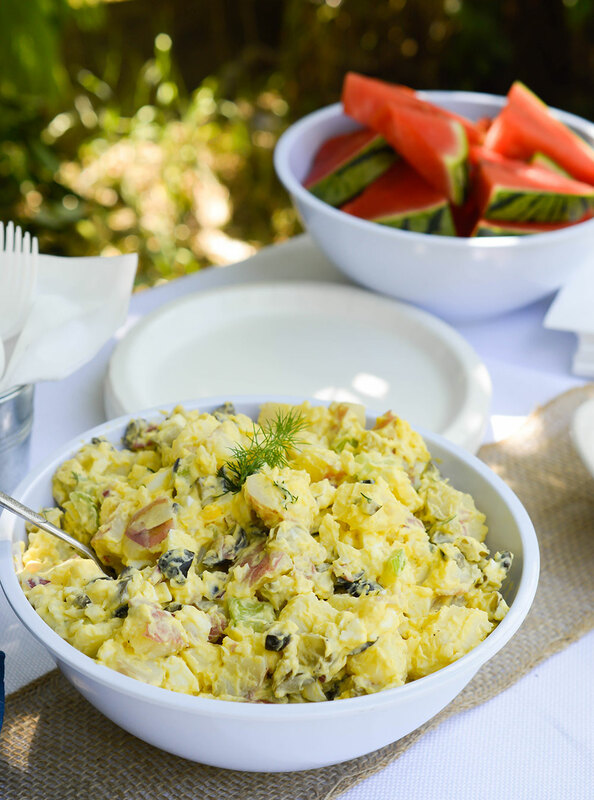 Enjoy this Classic Potato Salad Recipe at your next family barbeque. A creamy, traditional potato salad that is the ultimate summertime comfort food! Seriously People, I could eat potato salad by the bucket–full. It has been a favorite of mine since childhood. I’m usually all for putting an interesting twist on recipes. But not potato salad. Nope. This Classic Potato Salad Recipe is exactly how I have been eating it since I was a kid. Sometimes a recipe is perfect as is and should not be fussed with. This potato salad is made with red potatoes (because I don’t like to peel potatoes), fresh dill, mayo, olives, celery, red onion, dill pickles and tangy New Heinz® Yellow Mustard. The ultimate side dish to serve at your summertime barbeques! I made this potato salad for my afternoon barbeque. It was the perfect companion to the charcoal grilled hot dogs, watermelon, baked beans and sweet tea. No need to get too fancy for a casual bbq. I decorated with a white table cloth, burlap runner and a couple blue bandanas for a pop of color. With a few red dishes I was able to create a simple Red, White & Blue table setting. Because . . . what’s more American that a traditional backyard barbeque with friends and family!?!? 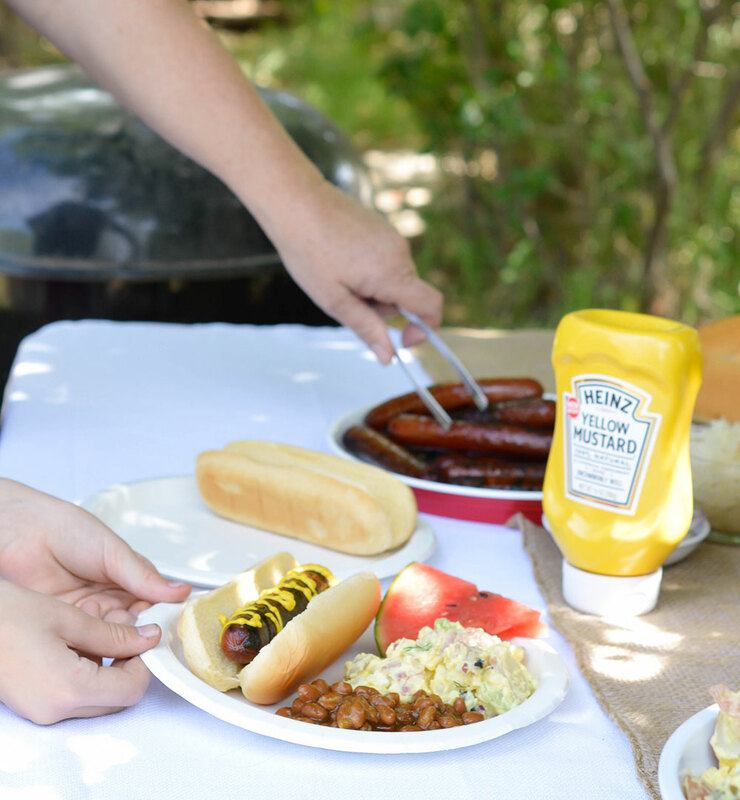 I love a good hot dog barbeque because it is easy to set up and serve. The person responsible for grilling isn’t stuck next to the bbq the entire time. 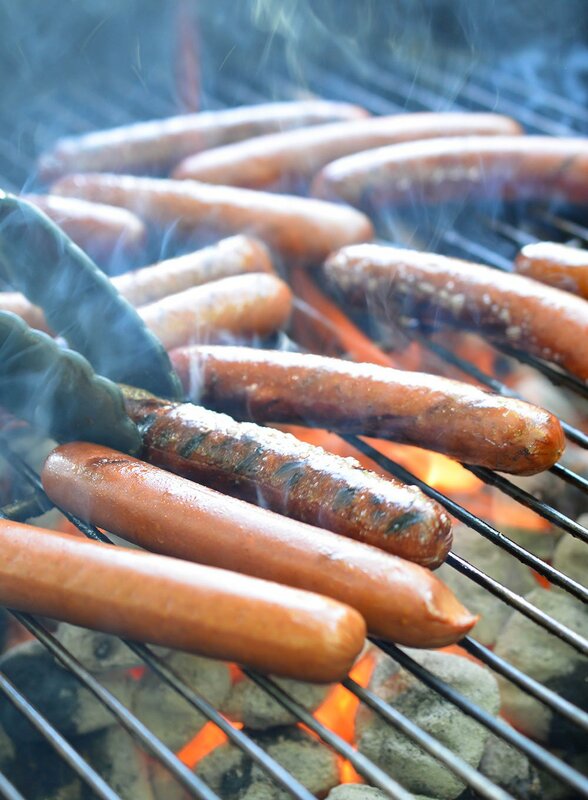 Just grill up a couple packs of hot dogs and enjoy! 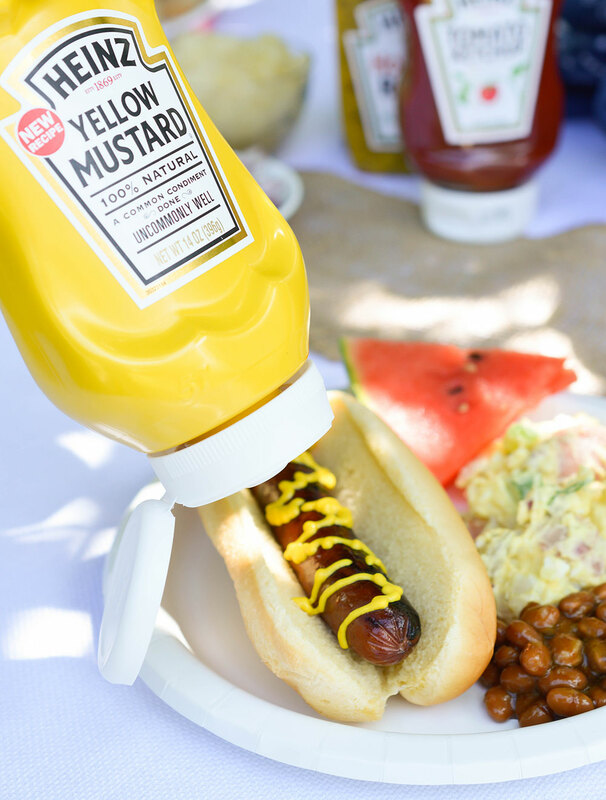 Whatever you do, don’t forget the Heinz Yellow Mustard. It is a must-have for any barbeque. Especially a hot dog barbeque! I also make sure to have Heinz Ketchup available for the kiddos. 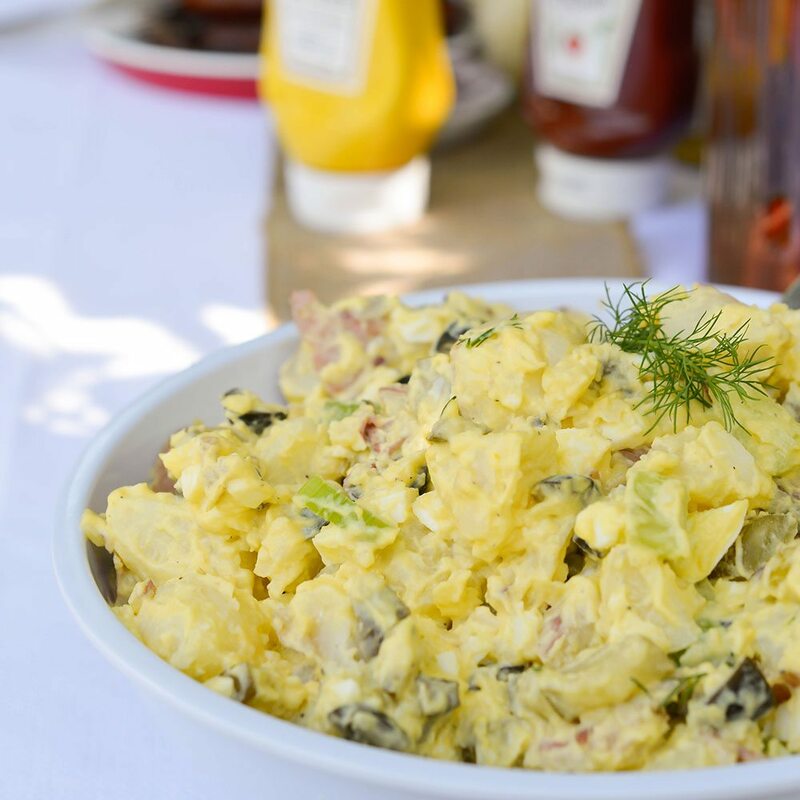 Like this Potato Salad Recipe, Heinz is a classic. Heinz has been providing uncommon quality since 1869. 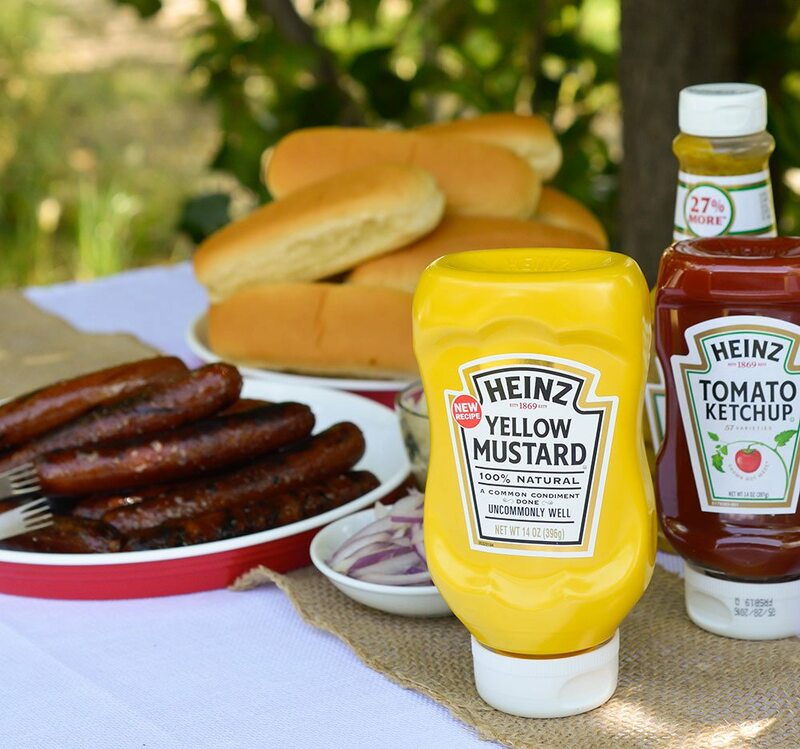 Heinz has been making food taste good for almost 150 years and is now applying that expertise to mustard. Try this new secret blend of spices and vinegar for the perfect balance of flavor and tang! Best part, no more watery mess! Heinz has designed their new Mustard top-down, squeeze bottle to prevent that first squirt of watered down product. No longer must you shake the bottle before using. That means no more soggy bread! Heinz Yellow Mustard doesn’t sink into the bread and make it soggy. It is a thicker mustard that sits on top. 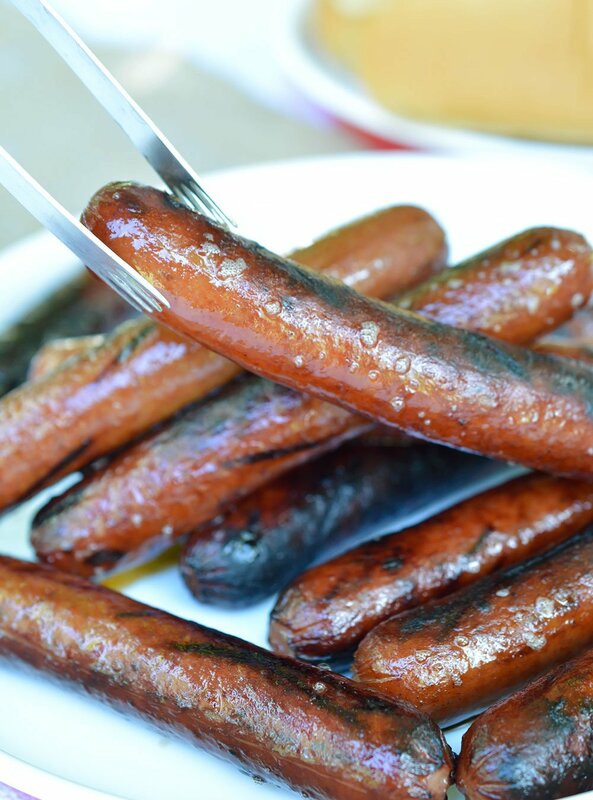 The other great thing about hot dog barbeques is that the kiddos can easily dish up their own plates. They love that. Make sure you offer a beverage for all of your thirsty guests. 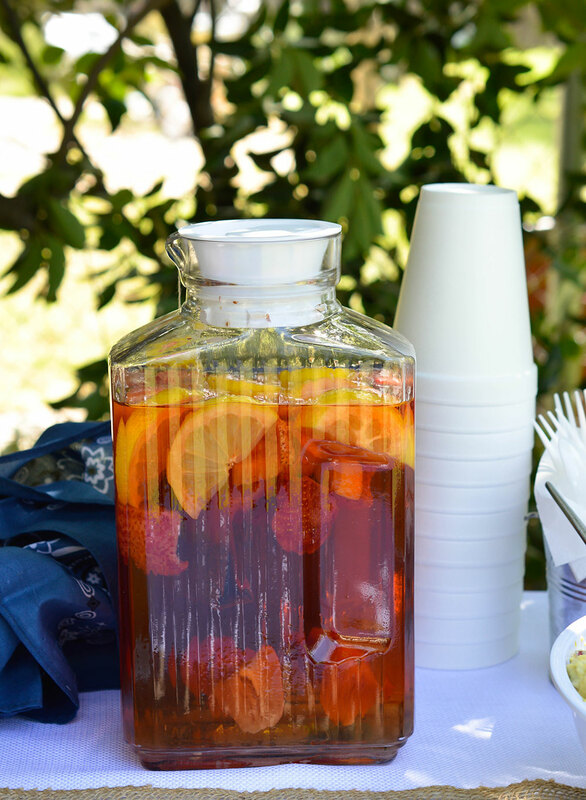 I made a batch of my Strawberry Lemonade Sun Tea. It is perfect for backyard bbq’s! Make this potato salad for your next summer party. It is sure to be a hit! Cover potato chunks with water and boil until tender but not falling apart. Drain and refrigerate potatoes until cooled. Place eggs in medium pot and cover with water. Bring to a boil, remove from heat and cover for 10 minutes. Remove eggs after 10 minutes and refrigerate to cool. This potato salad is intentionally underseasoned so that guests can adjust the salt and pepper to their personal preferences. 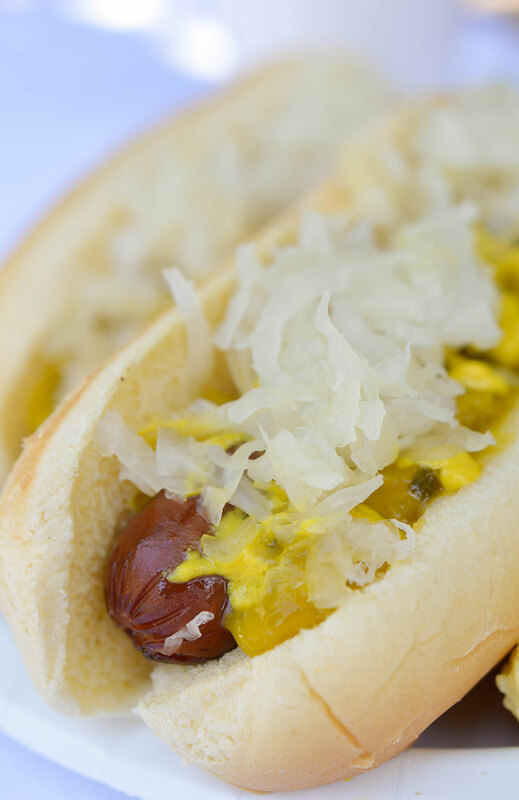 I am a sauerkraut, Heinz Yellow Mustard and dill relish girl. Always have been, always will be. Mmmm. Take a bite outta that! Hurray! Get down to your local Walmart for hot dogs and Heinz Yellow Mustard. Fire up that grill and have a party! 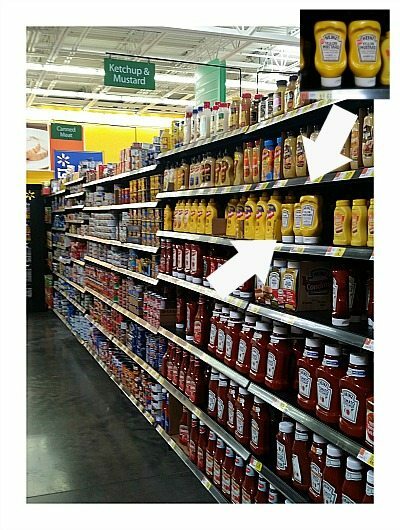 You can find Heinz Yellow Mustard at Walmart near the Heinz ketchup. It is also available at other major retailers. 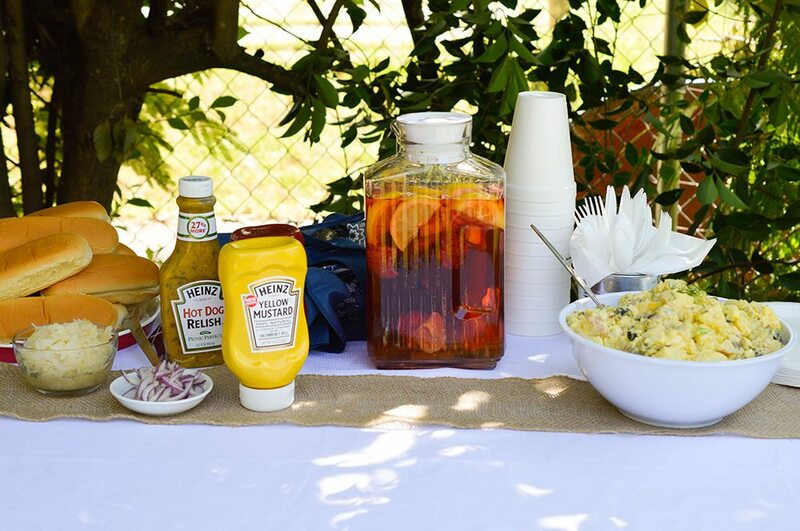 Nothing beats the classics, like your tasty potato salad and that yellow mustard. Both will be appearing at summer BBQs this season! now I’m craving BBQ! I could eat potato salad by the bowl full! This looks very close to the recipe my mom has always made, and it’s my favorite potato salad. Lol, I’m always craving bbq! Gotta love Mom’s Potato Salad! I LOOOOOVE all these summer food photos!! I can’t wait any longer for awesome weather and potato salads all-the-things! You can never go wrong with a good, classic potato salad!! I love a really mustardy potato salad and so this looks perfect to me! Great recipe! Substituted cauliflower for the potato. Yummy!